Deer mouse is a species of rodent mainly found in North America. 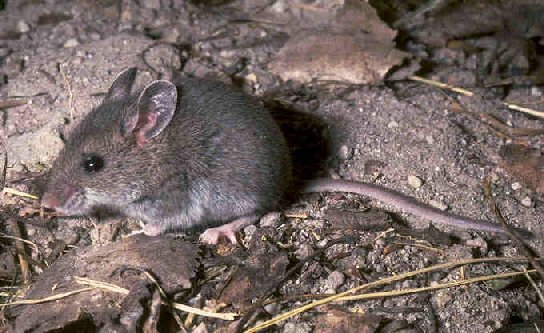 This Peromyscus species of mouse is carrier of the Lyme and Hantavirus diseases. 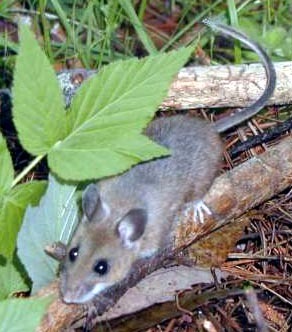 The White-footed Mouse or Peromyscus leucopus is the closest relative of the Deer Mouse. These mice are very small in size with an interesting coloration. Size: They grow somewhere between 8 cm and 10 cm (3 and 4 inches) in length (excluding the tail). The tail length of different sub species varies from 5 cm to 30 cm (2.0-5.1 inches). Body: The body is covered in soft fur. The ventral or underside of the body is white. Color: They can be of different colors including black, white and grey. They have four white legs and a multi-colored tail. Eyes and Ears: These rodents have large eyes and ears with good sight and hearing. 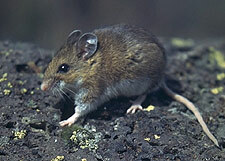 These mice can be found in different regions of North America, Alaska and Canada. The distribution range also includes some regions of South America. The mice of this species usually nest alone or in pairs in high hollow trees. They can also build their nests in deep burrows in ground. They inhabit forests, woodlands, grasslands and brushy areas. Various subspecies of this species prefer different habitats. The Home ranges of two Deer Mice usually do not overlap; however, sometimes two mice from opposite sexes may live in overlapping home ranges. These small mice have many adaptations that help them to survive and avoid predation. The color of the upper side of their body helps them to remain camouflaged making it hard for predators to find them. The Deer Mouse subspecies that live in trees have longer tails than the ones living on ground. These tails help them to climb tall trees and keep their balance. They change their diet habits according to seasons and availability of food. These omnivorous mammals eat leaves, seeds and insects during spring. During summer their diet mainly consists of leaves, seeds, fruits and berries. Various insects including caterpillars, spiders and other arthropods become a principal part of the diet of these mice during winter. Some behavior patterns of this mouse species differ from other mice. These mammals are nocturnal being active during night. They stay in their nests in trees or burrows in ground during daytime. They remain active during winter. These rodents gather food in their nests for winter as foraging is difficult for them during this season. 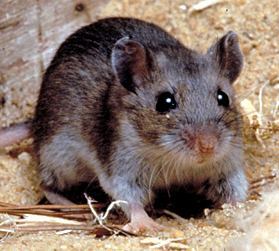 Unlike many other mice, various subspecies of this species stay active in open lands rather than in hidden underground runways. These solitary mammals do not usually interact with other mice of their own species. They generally avoid wetland areas like ponds and lakes. Common predators of these mammals include owls, minks, snakes, bobcats, weasels, skunks, foxes and coyotes. The reproductive season starts around March and continues through October. However, the exact time may vary in case of different subspecies. Their reproduction depends more on availability of food rather than on season. Females build nests using grass, tree roots and mosses. The male Deer Mice help the females to keep the litter safe in their nest. Young mice of this species are born blind and are not covered in the soft fur coat. However, they develop full fur coats within two weeks after their birth. Their eyes open after 13 to 19 days. They take approximately six months to reach the size and weight of an adult Deer Mouse. The average lifespan for the male mice of this species is 47.5 months while the females live 45.5 months in average. However, one particular Deer Mouse lived for 96 months in captivity. These rodents are among the principal carriers of the virus that cause Hantavirus Pulmonary Syndrome and bacteria that cause Lyme disease. Infected Deer Mice leave these viruses in their saliva, urine and droppings. These viruses and bacteria can enter human body through inhalation. Due to this reason, it is never advisable to dispose of the droppings of these rodents using a vacuum cleaner. These should be sprayed with disinfectants before being disposed of by sweeping. These mice can make quite desirable pets as they are quite easy to take care of. However, one should make sure that the pet Deer Mouse is not carrying Hantaviruses or the bacteria causing Lyme disease. They do not have the risk of carrying these diseases when they are captive bred in labs. Housing: The size of the cage or tank depends on the number of mice kept in it. A 45 cm×30 cm×25 cm glass tank is adequate for a pair. The tank should be placed out of direct sunlight. Care needs to be taken to keep it clean and hygienic. Feeding: These mice will eat fruits, vegetables, berries and nuts. One can also feed them with rat foods or rodent mixes. It is important to provide them with proper protein supplements. Handling: They can become quite tame as pets. It is still advisable to use gloves while handling them. Temperament: They can be kept with other mice of the same or different species without any difficulty. They are an interesting mouse species with their appearance and behaviors. This species is called the “Deer Mouse” because the coloration of their fur is similar to that of the “White-tailed Deer”. These mice are often used for many laboratory experiments as they keep themselves clean and are quite easy to take care of. Commercial ultrasonic devices fail to keep these rodents out of houses as such devices do not have any effect on them. This species is listed in the “Least Concern” category by the IUCN (International Union for Conservation of Nature) as there are no immediate threats to the existence of these mammals. Here are some photos of this mouse species for you to get an idea about their appearance. The fact that the Deer Mouse carries two severe diseases has been unable to keep humans from taking interest in them. They have found ways to make these mice harmless in order to keep them as pets or study them in labs. I am raisng a baby deer mouse a week old so cute! I am currently raising 3 baby deer mice. I would like to keep them once they get older, but I don’t want those diseases in my house. I found them at 5 days old. Do you think they could get diseases at such a young age?